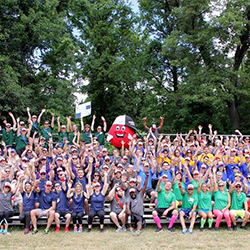 The first ever motionballU Marathon of Sport McMaster was a huge success welcoming 12 teams of students for a fun-filled day of athletic competition! 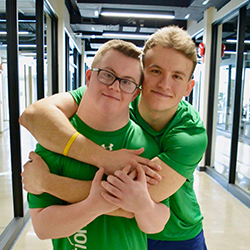 Students teamed up with local Special Olympics Ontario athletes and together, they competed in a variety of sports & activities including benchball, football, ultimate, soccer, seated volleyball and more! Thanks to the incredible support of these passionate students, we raised $6,500 net support of the Special Olympics Canada Foundation! For more information on how you can bring motionballU to your school or get involved in the 2018 motionball event at McMaster see below! 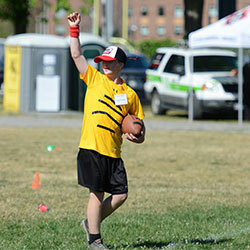 Included in your Team registration, each participant received: an Under Armour t-shirt, motionball hat, Pita Pit lunch, Powerade, drink tickets and admission to the Marathon of Sport after-party, fundraising incentives, and most importantly, a chance to play with the proud Special Olympics Ontario athletes who motionball supports! 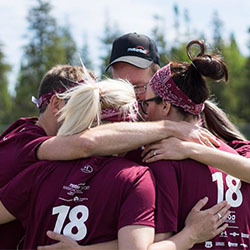 To sign up as a Team Captain for 2018, click here to connect with the motionball McMaster Team! We hope you’ll join us! Together, we can level the playing field for athletes of all abilities!